26th Annual Avila Beach Blues Festival - Otter Productions Inc. | Otter Productions Inc. 26th Annual Avila Beach Blues Festival - Otter Productions Inc. This is the 26th year for what has been a landmark Central Coast event, the Avila Beach Blues Festival. This year continues the tradition of the biggest and longest running blues festival on the Central Coast, with top name entertainment against the backdrop of the Pacific Ocean. 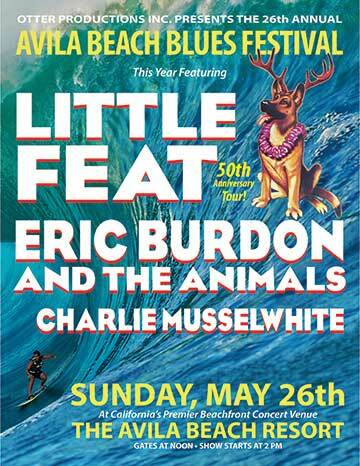 This is the greatest line-up of talent ever assembled for this festival… we are so proud this year to welcome back LITTLE FEAT as our headliner, on their 50th Anniversary Tour – the last time they visited our festival was in 1999… Eric Burdon & the Animals hold down the middle slot in their debut performance at the festival… and Central Coast favorite Charlie Musselwhite opens the show – the last time Charlie played the festival was in 1997! This is the party that kicks off the outdoor concert season! With VIP, Beach Club Balcony, reserved theater-style and table seating and General Admission Lawn tickets available for sale, this will be an afternoon concert, gates open at noon and the show will start at 2PM and continue until sunset. In the style of any great outdoor venue, you will be able to enjoy your favorite libation (adult beverages and premium beer and wine will be available for sale), snack (upgraded concert snacks available for purchase), watch world-class entertainment under the afternoon sky with your backdrop the Pacific Ocean. Advance Reserved and General Admission tickets will go on sale Friday, January 25th at Boo Boo Records in San Luis Obispo; on-line eventbrite.com; and scroll down to purchase on this site.. All Ages. 7 and under admitted free in Lawn Seating only when accompanied by paid adult, one child per one paid adult. Rain or Shine. Please no outside food or beverages. No pets. No umbrellas. Low-backed lawn chairs (2’ maximum back height) and blankets allowed in Lawn Seating only. No high-backed chairs will be allowed in venue. 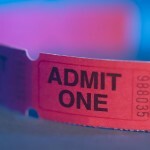 Pre-paid parking on site, included with your ticket purchase. A portion of the proceeds to benefit the Rossi Foundation, a non-profit 501 C3 and the community charities it serves. Doors are at Noon. Show starts just before 2PM. The approximate show times are: Charlie Musselwhite 2PM – 3PM; Eric Burdon & the Animals 3:30PM – 4:45PM; Little Feat5:15PM – 6:45PM. Advance Beach Club Balcony, Reserved and G/A tickets will go on sale Friday, January 25th at 10AM on this site and at Boo Boo Records in San Luis Obispo. All Ages.